Daimler Trucks Korea Ltd. would build the biggest delivery center for a foreign car brand in South Korea at a cost of 50 billion won ($44.6 million) in an ambitious move to expand its share in the Korean commercial vehicle market. 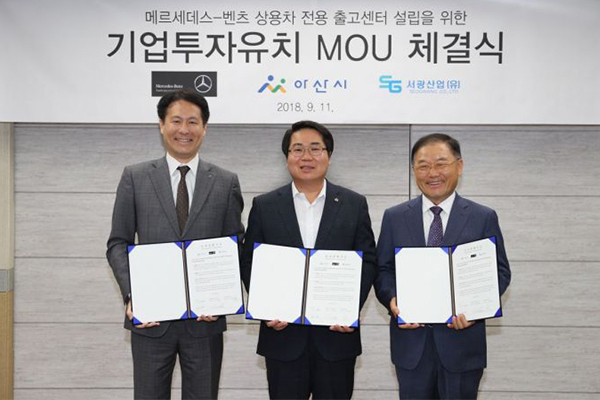 The company announced Thursday that it signed a memorandum of understanding with Asan city and Seokwang Industrial Co. to set up a delivery center for Mercedes-Benz commercial cars in Asan, South Chungcheong Province. Daimler Trucks will invest about 50 billion won to construct a 50,900-square-meter delivery center on area of 132,000 square meters in Asan. The new center will be the largest delivery center owned by foreign automakers operating in the country, about twice bigger than the company’s existing center in Hwaseong, Gyeonggi Province. The new delivery center will be just 15 minutes away from Cheonan-Asan station. It will be equipped with a driving training center, tuning facility, test driving track, and comfortable lounge area for buyers to wait until their cars are ready. “We will work hard to contribute to the local commercial car market and regional economy by expanding our business to tuning and remapping to meet the demands of local customers,” said an official from the company. Seokwang Industrial, a local company engaging in engineering for commercial cars and manufacturing parts for machines and trucks, will be in charge of operation and management of the delivery center, Daimler Trucks Korea said.